On my doorstep, almost literally, and I missed it. 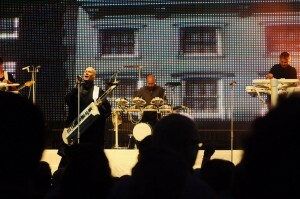 Human League to headline Redcar Rocks Festival! Electropop legends The Human League are set to rock Redcar as a popular music and comedy festival returns for its fourth year. The “Don’t You Want Me” group were today confirmed as headline pop act for the Redcar Rocks festival on Friday, July 11. The Sheffield outfit, whose eight top 10 UK singles include Love Action, Mirror Man and (Keep Feeling) Fascination, are no strangers to Teesside festivals, having gone down a storm at the 2010 Stockton Riverside Fringe. But by contrast, the Thursday, July 10 headliners are a more classical outfit – the English Philharmonic Orchestra. Organisers say Redcar Rocks 2014 will feature two days of great comedy and a full line-up of music across three stages, plus street performers, Silent Disco, cocktail and real ale bars and a food village.